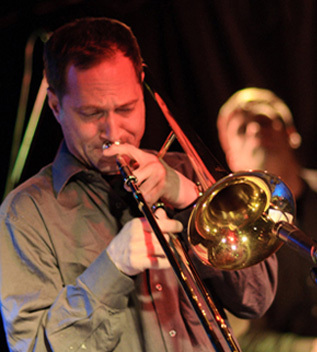 2010 JUNO nominee and Galaxie Rising Star winner Toronto trombonist Darren Sigesmund has firmly established his Strands project as one of Canada's leading national and international touring ensembles. Following up on his 2008 debut quintet CD Strands, Sigesmund released Strands II, nominated for a 2010 JUNO for Best Traditional Jazz Album. Sigesmund received the 2010 Galaxie Rising Star award for Best Composition ("Dance for Leila") at the Festival International de Jazz de Montr�al. The music in Strands consists of Sigesmund's award-winning signature: complex musical passages, accessible melodies, wordless vocalizations and a sound that synthesizes wildly diverse influences from Latin, jazz and classical music into totally distinctive works. From the drive and passion of Argentinean Tango and Brazilian song forms, the rhythmic sophistication and fast-paced melodies of Balkan music to the lyricism and counterpoint of Western classical compositions, Sigesmund distills these influences into cutting-edge Canadian jazz. With vigor and flair, Sigesmund has woven the textures of voice and percussion into fresh new compositions for the Strands II recording which features special guest New York saxophonist Tim Ries of the Rolling Stones. Strands II is funded by the Toronto, Ontario and Canada Councils. In April 2011, after a fifth European tour, Sigesmund self-presented his Strands ensemble in Toronto with special guests New York-based Mark Feldman (violin) and Gary Versace (piano & accordion). With support from the Ontario and Toronto Arts Councils, Sigesmund is currently working on new compositions for a Strands III recording. Sigesmund has led his Strands project across the globe regularly since 2003, including 5 trips throughout Europe, with performances in Spain, the UK, Germany, Switzerland, Luxembourg, Belgium, Denmark, and Finland. Other notable tours across Asia & Australia include concerts at Shanghai's celebrated club JZ, Hong Kong's historic Loke Yew Hall, South Korea's Jarasum International Jazz Festival, the Cairns Tanks Arts Centre in Australia, Japan Expo 2005, and the Canadian Embassy in Tokyo. Strands has been featured on Germany's national radio station Bayerischer Rundfunk, the Australian Broadcasting Corporation, Belgium's RTBF Musiq3, Portugal's Radio R�dio Universit�ria do Minho (RUM) and Ireland's RTE Lyric FM. Darren has studied and performed at the internationally renowned Banff Jazz Workshop with acclaimed artists, such as Dave Holland, Kenny Wheeler, Julian Priester, Richie Beirach, Dave Liebman, Steve Coleman, Don Thompson, Pat Labarbara, and Hugh Fraser. On trombone, Sigesmund has studied trombone with Michael Davis (New York), Ian McDougall (University of Victoria), Jerry Johnson (Stratford Festival) and Gord Sweeny (Toronto Symphony). After studying at the University of Toronto for Jazz Performance Program, Sigesmund honed his composition skills under the tutelage of Toronto instructor Frank Falco. Sigesmund currently teaches piano at Humber College and privately. Sigesmund is also an accomplished professional chef, having cooked for several years in some of Toronto's finest restaurants after his apprenticeship with celebrated chef Michael Stadtlander at Eigensinn Farm.